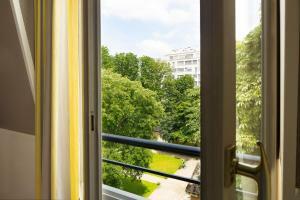 Hotel Tour Eiffel is located on a side street just 750 metres from the Eiffel Tower. The hotel offers an internal garden courtyard and en suite accommodation with free WiFi access. 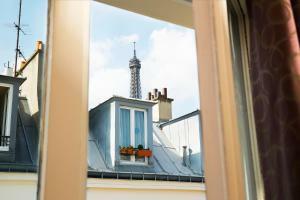 An LCD TV, universal plug and a phone are provided in each guest room at Hotel Tour Eiffel. Some rooms have a view of the courtyard. All rooms are serviced by a lift. Ecole Militaire Metro Station is 500 metres from the hotel and provides direct access to the Arc de Triomphe and the Champs-Elysées. Staff are available 24 hours and shuttle to Paris airports and train stations can be arranged. Please note that preautorisation of the credit card is cancelled the day of arrival. Please inform Hôtel Tour Eiffel in advance of your expected arrival time. You can use the Special Requests box when booking, or contact the property directly with the contact details provided in your confirmation. Guests are required to show a photo identification and credit card upon check-in. Please note that all Special Requests are subject to availability and additional charges may apply. Rate: € 129.00 ... € 329.62; select dates below to get current rates. Rate: € 297.18 ... € 335.73; select dates below to get current rates. The elegant rooms include a flat-screen TV with satellite channels. It also features free WiFi and a universal adapter. At least 1 of the guests must be a child.